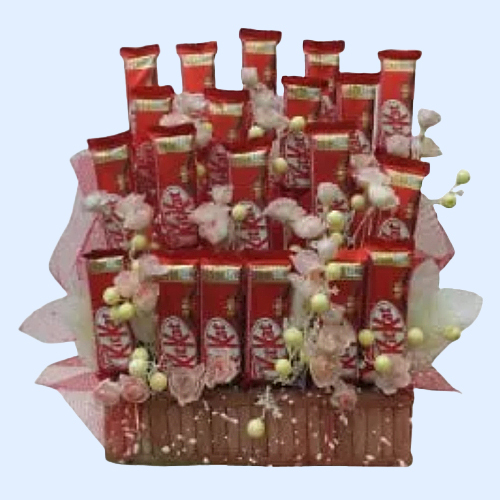 Order this Sensational Nestle Kitkat Chocolate Hamper and make your dear ones happy. This Gift Basket is filled with 20Pcs KItkat Chocolates (18gm). Flowers Delivery Kannur, Send sweets Goraya, Wedding Cake Noida, Diwali Mithai Bhatinda, Send Flowers and Gifts to Vadodara, Online Shop Roorkee, Flower to Vishakhapatnam, New Year Flowers Ambala , Fresh Fruits Jallandhar, Send Gift Tanjavur, Dry Fruits to Bikaner, Birthday Delivery Thiruvalla, Sending to Chandigarh, Flower shop Ratnagiri, Bhavnagar Online Cake Delivery.